Blood Gas And Electrolyte Analyzers Market size is set to exceed USD 5 billion by 2024; according to a new research report by Global Market Insights. Increasing burden of chronic ailments such as cancer and diabetes worldwide will drive the blood gas and electrolyte analyzers market over the forecast timeframe. As per the International Diabetes Federation, diabetes affected more than 425 million individuals globally in 2017. The number is expected to reach around 629 million by 2045. Increasing chronic disease burden in developed as well as developing countries is expected to boost the demand for blood gas and electrolyte analyzers in upcoming years. Rapidly growing geriatric population that is prone to several diseases owing to structural and functional changes will serve to be another positive impact rendering factor on blood gas and electrolyte analyzers business growth. As per the United Nation’s World Population Ageing report, in 2017 there were 962 million people aged 60 years and above. The number is expected to reach 2.1 billion by 2050. Furthermore, technological advancement in analyzers will favor business growth. However, high cost of advanced analyzers coupled with complex regulatory scenario may hamper industry growth during the forthcoming years. Portable analyzers segment held highest revenue in 2017 and is estimated to show 7.1% CAGR during the forthcoming years. High segmental growth is attributable to focus of industry players on development of technologically advanced products. For instance, ABL80 FLEX blood gas analyzers, developed by Radiometer, are small, user-friendly portable analyzers for low-volume settings. Availability of such advanced devices will foster segment growth. 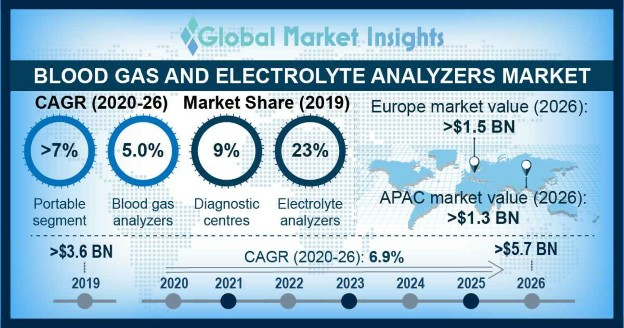 Electrolyte analyzers segment accounted for 23.6% revenue share in 2017 and is estimated to grow significantly over the forecast timeframe. Increasing prevalence of renal and cardiovascular disease will surge the demand for electrolyte analyzers for measurement of body electrolytes. Growing adoption of these analyzers in hospital settings, laboratories as well as point-of-care settings will further favor segmental growth. Point-of-care segment dominated the blood gas and electrolyte analyzers market with USD 1.4 billion revenue in 2017 and is anticipated to grow substantially in the coming years. Ability of point-of-care testing to deliver decentralized, patient-centric care to patients and provide rapid provision for blood gas and electrolyte measurements will further spur the segment size. U.S. blood gas and electrolyte analyzers market dominated North America region with USD 1.0 billion in 2017 and is estimated to show similar trend during the forecast timeframe. Growth is attributable to high prevalence of chronic diseases such as diabetes, cancer and cardiac disease in the nation. Technological advancement coupled with strong foothold of key industry players in the U.S. will further spur revenue size during the forthcoming years. Germany blood gas and electrolyte analyzers market held significant revenue share in 2017 and is anticipated to witness 5.9% CAGR during the forecast timeframe. Mortality rate due to cardiac diseases is high in Germany as compared to other OECD countries. Moreover, well-developed healthcare infrastructure coupled with increasing healthcare spending will further boost the business growth. Notable business competitors operating in the blood gas and electrolyte analyzers market include Alere Medical, Bayer, Medica, Convergent Technologies, Allele Biotech, Dalko Diagnostics, Nova Stat, Samsung Medison, Radiometer Medical, Edan Instruments, Siemens and Roche. These competitors implement several inorganic and organic strategic initiatives to strengthen their market position and enhance product portfolio. For instance, in December 2014, Roche Diagnostics announced acquisition of California-based, privately owned Ariosa Diagnostic Inc. This merger enabled Roche to enter the cell-free DNA testing and NIPT services market and capitalize on market opportunities.